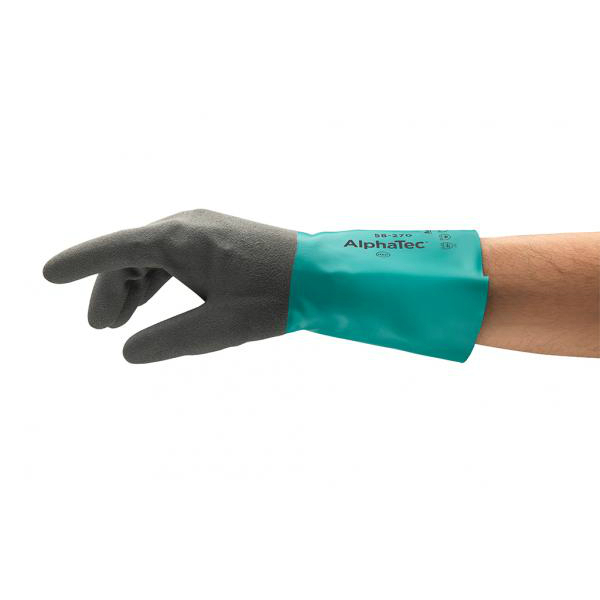 The Ansell AlphaTec 58-270 Chemical-Resistant Gauntlet Gloves are anti-static, liquid-proof gauntlets designed for light to medium chemical applications. Made using a thin, double-wall nitrile shell and a seamless nylon liner, these gloves provide superior hand protection with optimal flexibility for precision tasks. Thanks to Ansell Grip Technology, the AlphaTec 58-270 Gloves provide good grip for handling both small oily and wet parts, which makes them ideal for tasks in the automotive and machinery and equipment industries. The Ansell 58-270 Gloves have been produced using a unique formulation to provide high performance with optimal flexibility. This formulation enables the wearer to move their hands naturally without constriction, and reduces the occurrence of hand fatigue with extended wear. The table below shows the test results of the Ansell AlphaTec 58-270 Gloves according to EN 388:2016 Mechanical Risk specifications.